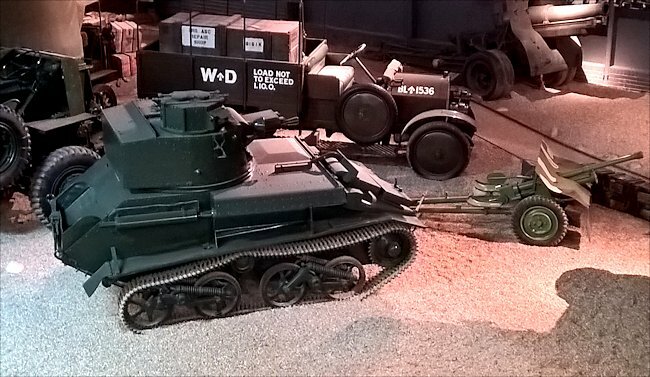 This surviving British Expeditionary Force WW2 British Vickers Light Tank MkVI can be found at the Imperial War Museum Duxford. They were outclassed by the German Panzer Mk III tank. Most were left at Dunkirk during the evacuation. Vickers Light Tank MkVI Tank at the Imperial War Museum Duxford armed with a .50cal and a .303cal machine gun. IWM Duxford is south of Cambridge on the A505 at Junction 10 of the M11 motorway, less than 50 miles from Central London and approximately 40 minutes from the M25 (Junction 27). IWM Duxford is easily accessible from the A1, A14, M1 and the North, via the M11. There is free parking. Post code: CB22 4QR. The nearest train stations are Whittlesford, Royston and Cambridge. There are taxi ranks at both Royston and Cambridge stations. Whittlesford station is the closest to the museum but does not have a taxi rank. On Sundays and special events days there is a direct Myalls 132 bus service from Cambridge to IWM Duxford. 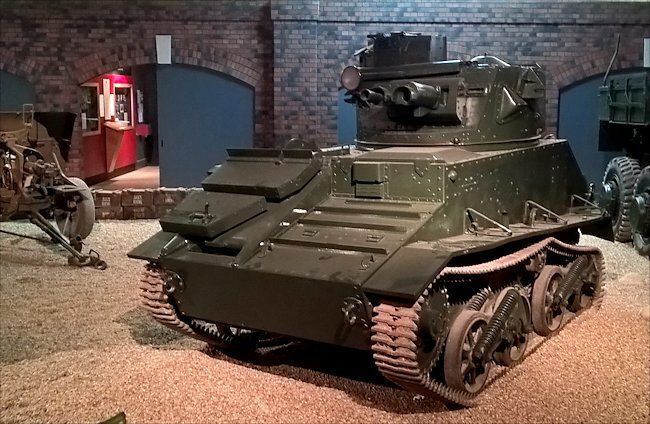 The Vickers Light Tank Mk VI was in front line service from 1936 to 1942. It was in production by Vickers-Armstrong from 1936 to 1940. Around 1682 were built. This light tank required a crew of three: commander, Gunner and driver. The armour thickness ranged from 4 mm to 14 mm which was just enough to protect the crew from small arms fire and shrapnel. It did not have a gun that was capable of firing armour piercing shells. It was only armed with a .50 inch Vickers Machine Gun (Mk VIC 15 mm Besa machine gun) and an additional .303 inch Vickers machine gun (Mk VIC 7.92mm Besa Machine Gun). It was powered by a meadows 6 cylinder petrol engine that produced 88 hp. Its maximum road speed of 35 mph (56 km/h) was fast. Its off road speed maximum was 25 mph (40 Km/h). it had an operational range of 130 miles (210 km) before the crew needed to refuel the tank. The extended rear of the Vickers Light Tank Mk VI Tank's turret was used to fit a radio. 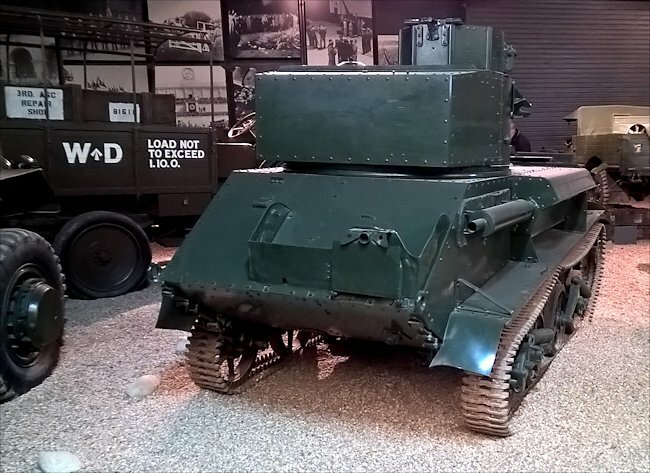 Following on from the Mk V light tanks, the Mk VI was identical in all respects except for the turret which was further redesigned to give room in the rear for a wireless set. In the Mk VIA the single return roller was removed from the top of the leading bogie and attached to the hull sides. The Mk VIB was a vehicle mechanically similar to the VIA, but with detail differences to simplify production. These alterations included a one-piece armoured louvre over the radiator (instead of a two-piece louvre) and a plain circular cupola in place of the faceted type of the VIA. The Light Mk VIB Indian Pattern, produced for the Indian Army, was identical to the standard model except for the removal of the commander's cupola in favour of a plain hatch in the turret roof. 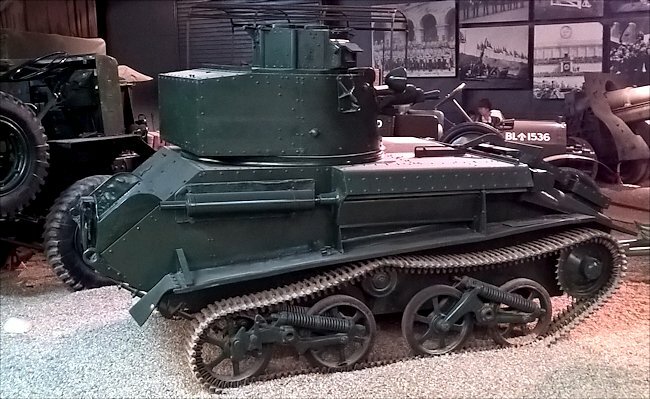 Vickers Light Tank Mk VI Tank were used in France to try and stop the German invasion of France May 1940. The Mk VIC, last of the series, also lacked the commander's cupola and was more powerfully armed than its predecessors, having co-axial 15mm and 7-92mm Besa machine guns in place of the .303 and .5 Vickers machine guns of the earlier marks. It also had wider bogies and three carburettors in the engine to give improved performance. The Mk VI series entered production in 1936 and VIC production tailed off in 1940. These were in wide service with the British Army at the outbreak of war in 1939, the VIB being produced and used in the largest numbers. The bulk of British tank strength in 1940, in France, in the Western Desert, and elsewhere was in fact composed of Mk VI lights and they were frequently called on to act in the 'cruiser tank' role rather than the reconnaisance role for which they were intended—usually with heavy losses to themselves. Vickers Light Tank Mk VI Tank at the Imperial War Museum Duxford. After Dunkirk, these light tanks were also widely used to equip armoured divisions in Britain and were still in quite wide 'first line' use as late as 1942, though by then being replaced by later types and relegated to training. Tank, Light AA Mk I: Experience under the Blitzkrieg conditions of the German invasion of France and Flanders in May 1940, when the British first encountered co-ordinated air strikes in support of attacks by enemy armoured divisions, led to the hasty development of specialist AA tanks. Experimental versions, based on the Mk V chassis, have already been described. Production vehicles had a power-operated turret with four 7-92mm Besa MGS set in a modified superstructure. The first variant, Tank, Light AA Mk I, was on a Mk VIA chassis. Tank, Light AA Mk II: This was essentially the same as the Light AA Mk I, but had improvements in the form of better sights and a roomier, more accessible, turret. It also had an external ammunition bin mounted on the hull rear. The Tank, Light AA Mk Il was built on the Light Mk VIB chassis. A troop of four AA tanks was attached to each regimental HQ squadron. Tank, Light, Mk V 1B, with modified suspension: A small number of Mk V IBS were fitted with larger diameter sprocket wheels and separate idlers at the rear (as in the Light Mk II) in order to give longer ground contact and improved ride. This modification was only experimental, however, and was not adopted as standard. Tank, Light, Mk VI, Bridgelayer : One chassis was converted by MEXE in 1941 to carry a 'light folding scissors bridge. Shipped to Middle East Forces for combat trials, it was apparently lost en route and no further record of it exists.